Whizz off in search of fun and adventures with Prince Puppycorn™ and his friends. Relive favorite moments from the happiest, most sparkly and colorful TV series around with the LEGO® Unikitty™! 41452 Prince Puppycorn™ Trike. This fun set features 2 sparkle matter stud shooters, bone, flag, huge rolling basketball for a front wheel and baseball-decorated rear wheels! The set also features a crate of treats and 3 buildable figures from the series. Get down and celebrate with Unikitty™ at the hippest, happiest party in town! 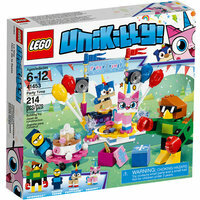 Relive favorite moments from the happiest, most sparkly and colorful TV series around with the LEGO® Unikitty!™ 41453 Party Time set, featuring a DJ booth with decks, speakers, balloons and flags, a spinning dancefloor with lights, gift boxes for guests and an enormous birthday cake to wheel in on a cake trolley. Have fun at the fairground with Unikitty™, Prince Puppycorn™ and friends! Relive favorite moments from the happiest, most sparkly and colorful TV series around with the LEGO® Unikitty™! 41456 Unikingdom Fairground Fun set. With a working roller coaster, spinning chair ride and super cool dodgems, it’s impossible not to have fun! There's also a shop and 2 refreshment stands to buy treats while you wait in line for the rides. 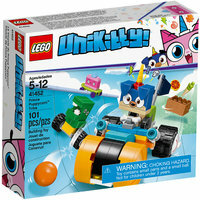 Jump into the Cloud Car with Unikitty™ and spread a little sparkle matter! 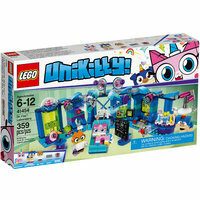 Relive favorite moments from the happiest, most sparkly and colorful TV series around with the LEGO® Unikitty™! 41451 Cloud Car, featuring a spinning propeller and 2 stud shooters to spread sparkle matter studs wherever you go. 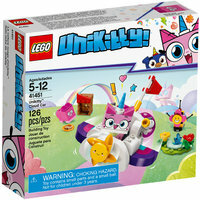 There’s also a small park scene and Square Bear's house to build, where Unikitty™ can meet her friends Feebee and Square Bear for even more crazy fun! Become Dr. Fox™ in her Unikingdom laboratory! Put on your Dr. Fox™ glasses and build a life-sized LEGO® Unikitty™! 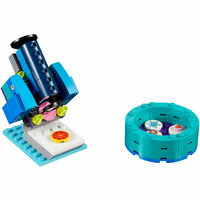 40314 Dr. Fox Magnifying Machine with zoom action and petri dish. Pretend to examine the LEGO elements under the microscope and further Dr. Fox’s vital research into sunshine and sparkle dust!